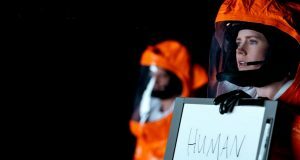 ARRIVAL… Cleverly Original, or 1960’s Retread? Browse: Home » ARRIVAL… Cleverly Original, or 1960’s Retread? 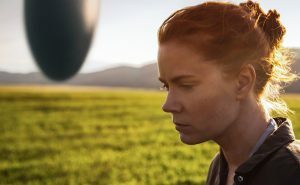 I’ve seen the movie, and yes, it is as deeply emotional and cerebral as all the previews and reviews make it out to be. Praiseworthy? Certainly. But startlingly original? Well….. 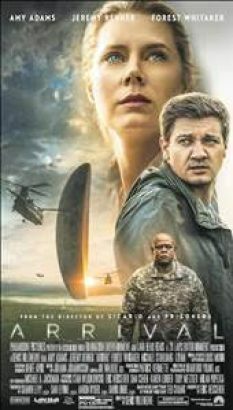 The premise of ARRIVAL is that 12 mysterious spacecraft (gargantuan split ovoids) touch down (actually hover several feet off the ground) across the globe and an elite team of researchers lead by expert linguist Louise Banks (Amy Adams) are brought together to investigate the one in the United States’ back yard (Montana). 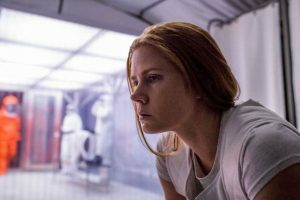 Immediately Banks is stymied with a written alien language that resembles circular Rorschach ink blots, each one apparently possessing the equivalent information of a multitude of paragraphs. 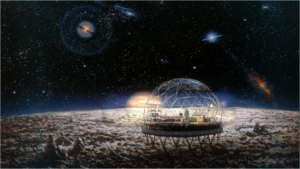 As mankind teeters on the verge of a global war with the seeming invaders, Banks and her team race against time for answers, the biggest one being the nature of time itself, and how it is perceived. And therein lies the rub. Near the end of the movie Dr. Banks realizes that the Heptapodian language itself, when understood, gives one the ability to view time in a non-linear non-Euclidean manner, i.e., there is no beginning, middle, and end to your life… all the events of your life are happening at the same time, and you can move your consciousness backward or forward in your own personal timeline in moments of great stress, danger, and need, and that is exactly what Banks does, garnering information from her future self that she puts to use in the seeming present of the movie. This non-linear approach to time is being lauded by pundits and reviewers all across the world, but I’ve yet to find a single critique mentioning that this is hardly anything new in Science Fiction. 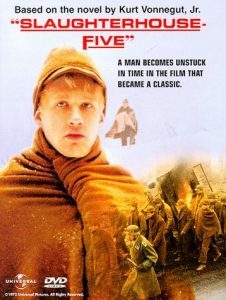 All you have to do is read acclaimed author Kurt Vonnegut Jr’s classic 1969 anti-war Sci-Fi novel, SLAUGHTERHOUSE FIVE (later adapted into a movie in 1972), whose main character, Billy Pilgrim, is abducted by aliens who teach him their non-linear conception of time, which allows him to leapfrog throughout his own life, from child, to adult American prisoner of war in WWII Germany, and even to the future when he is assassinated as an old man. 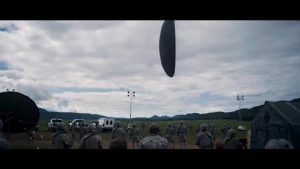 The Tralfamadorians, higher-dimensional beings that you never see in the movie and can only hear, clearly have dibs on this time-hopping consciousness praised in ARRIVAL. 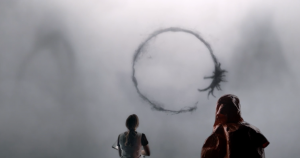 So do I recommend ARRIVAL? Absolutely. Just remember, though, on the road to an original idea you are bound to bump into a Greek along the way.